Johnson & Galyon Construction would like to say a sincere Thank You to all of our veterans and we encourage everyone to celebrate our veterans for their service and sacrifice. Whether you served in the Marine Corps, Army, Navy, Air Force, Coast Guard, National Guard, active duty or reserves, your commitment and dedication to serving and protecting our country is greatly appreciated. Johnson & Galyon Construction was recently contacted by Fulton High School to partner with them on a Work Based Learning opportunity for a student currently interested in a career in construction and possibly engineering. Ara Rickman, the Career and Community Coordinator for Fulton, had a high school senior who showed an aptitude for construction and the necessary maturity to participate in such a program. Work Based Learning is a program offered by the State of Tennessee which provides real world work opportunities for students for which they get credit towards their High School Diploma. The goal is to provide the students with a sample of what working in a certain professional field might be like prior to entering the workforce full-time after graduation. This also provides the student the opportunity to demonstrate to a potential future employer what they are capable of doing. Concerns for the construction industry in the past around such programs have revolved around safety and insurance. The State of Tennessee has assisted with the insurance problem by covering the students as long as the place of work has been visited and reviewed by the school prior. In addition, only students who have shown the necessary maturity and who have successfully completed curriculum required safety courses are allowed to participate. The employer may also offer additional safety training as they would any new hire and follow that up with continual weekly safety training. Johnson & Galyon is proud to have partnered with Fulton High School on this Work Based Learning opportunity and we look forward to continuing this relationship far into the future. For over 100 years Johnson & Galyon has valued relationships with our clients and our community. We’ve developed these relationships by impulsively doing what is right, reliably doing what we say, valuing people, communicating honestly, thoroughly, and authentically, and exercising accountability in a context of grace and truth. These are the attributes that set Johnson & Galyon a part from our competition in the construction industry. Johnson & Galyon Construction was recognized by the City of Knoxville during their first annual Disadvantaged Business Enterprise (DBE) Awards Ceremony. Mayor Madeline Rogero, Purchasing Agent Boyce Evans and Assistant Purchasing Agent Pamela Cotham presented eight companies with awards at the event. Johnson & Galyon and First Place Finish were recognized for their work on the Lakeshore Park Administration Building Renovation project with the Partnership Award. First Place Finish is a Women-Owned, Small Business Enterprise that was key to the success of the overall project. 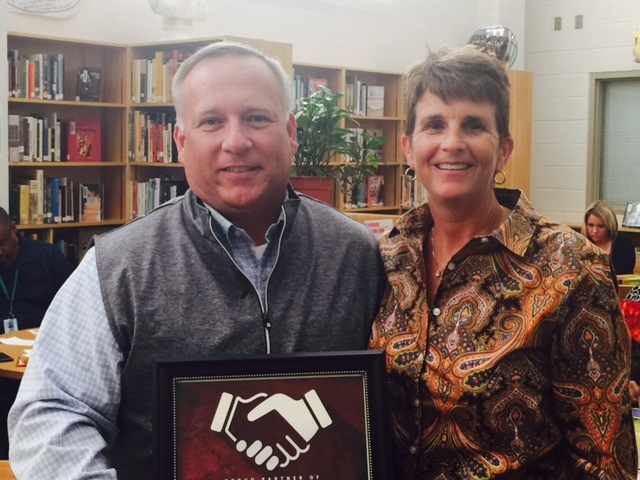 Johnson & Galyon was the only non-DBE company presented with an award during the ceremony. Johnson & Galyon has a long history of working with DBE companies including those owned by minorities, women, veterans and many other types of small businesses. We have a commitment to diversity that is represented in our business strategy and our business relationships. Johnson & Galyon currently holds contracts with M/W/DBE, Veteran-Owned and Small Businesses which exceed $25,000,000. 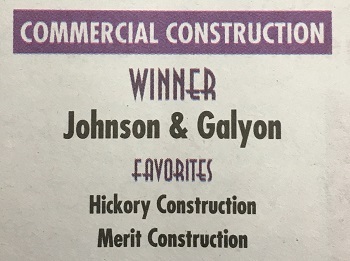 Johnson & Galyon was awarded this year’s 2016 Best of Knoxville for Commercial Construction and listed as a 2016 Best of Knoxville Favorite for Residential Construction. As a member of the Knoxville community since 1914, Johnson & Galyon is both humbled and honored to be recognized for their contributions to this great city. The Johnson & Galyon team is grateful to all of our clients and the relationships that have developed over many years. Relationships are the reason our company has existed for over 100 years and we look forward to growing those relationships over the next 100 years. Supporting the Knoxville Community and Building its Landmarks Since 1914. Johnson & Galyon Construction is a long-time supporter of the Knoxville community and activities that promote healthy living. This year we’re supporting two teams for the American Heart Association (AHA) Heart Walk. We are encouraging all Johnson & Galyon’s construction partners and their families to participate in this year’s walk taking place on Sunday afternoon, September 18th. Please feel free to register or contribute to one of our two teams. Johnson & Galyon Construction would like to express our congratulations to the University of Tennessee Medical Center on their 60th Anniversary! Celebration is well deserved as they have been a key member of the Knoxville community, East Tennessee and the surrounding area since their opening in 1956. But, our relationship began 4 years earlier. 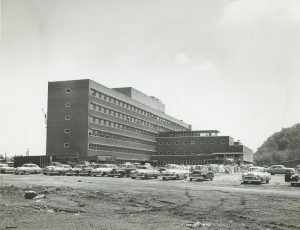 Construction of the University of Tennessee Memorial Research Center and Hospital (1955), now UT Medical Center. In 1952 Johnson & Galyon was known by another name, Johnson & Willard. It wasn’t until 1955 when we were incorporated under the name Johnson & Galyon. In October of 1952 the University of Tennessee accepted bids on a new project, the University of Tennessee Memorial Research Center and Hospital. The low bidder…Johnson & Willard. This was the beginning of one of our company’s most important relationships which still thrives today. After almost 64 years and hundreds of UT Medical Center projects later, Johnson & Galyon will begin the construction of the new Heart Hospital Expansion. How have we maintained this relationship over the years? Expertise and execution. Johnson & Galyon’s first significant healthcare construction project was in 1929 with the construction of St. Mary’s Hospital in North Knoxville. Ever since, we’ve been involved in healthcare construction all over the Knoxville region. Our healthcare construction experience has provided the expertise UT Medical Center required to build the facilities which serve their patient’s needs and grow into what it has become today. In addition to our expertise, Johnson & Galyon was able to execute on the plans and advice it has provided over the years. Advice and consultation are one thing, but performance is another. Relationships depend on doing what you say you’ll do. If you continually fail to live up to your word, those relationships will fail as well. We believe this so deeply “Reliably doing what we say” has become one of our Core Beliefs as a company. As a result, relationships like those with the University of Tennessee Medical Center will continue to thrive for many years to come. Johnson & Galyon is well underway with two outstanding Medical Office Building construction projects in Lenoir City, TN; the University of Tennessee Medical Center – Regional Health Center-Lenoir City and the Pediatric Consultants of Lenoir City. Both construction projects are Construction Manager At-Risk delivery, which involves significant engagement from Johnson & Galyon through the pre-construction phase. Pre-construction involves the estimating and budgeting of the Owner and Architects design documents throughout all phases of design. This allows the client to be well informed during the design process of the budget necessary to complete the project. Johnson & Galyon provided the clients with estimates at the Schematic Design, Design Development phases and also several estimates through completion of the Construction Documents. At an agreed upon point in the design phase the Johnson & Galyon estimating group issued a Guaranteed Maximum Price (GMP) which transfers the cost risk of construction to the general contractor. Over 70% of Johnson & Galyon’s project are delivered using the Construction Manager At-Risk method, allowing our clients to make informed decisions through all phases of construction. Medical Office Building Construction requires a unique skill set. Depending on the complexity of medical services provided to patients, these projects can often be just as complicated as hospitals. Facilities like these may contain imaging equipment, such as an MRI or X-Ray, as well as procedure rooms for out-patient procedures. All require significant engagement with the client early on in the design process to assure effective and efficient use of construction materials. Both Medical Office Buildings have completed site excavation, foundations and underground utilities. The UT Medical Center project is a multi-story building which is nearing completion of its structural steel frame. The Pediatric Consultants project is a single story building which will use metal studs to support the structure. Both construction projects should be complete later this year. If you have any questions about Medical Office Building Construction or the differences between construction delivery methods (General Contractor, Construction Management, Design-Build), please go to the Contact page of our website. Johnson & Galyon, Inc. is a construction firm with over 100 years of experience serving East Tennessee and the Knoxville area. Since the early days of the company constructing projects like Cherokee Country Club and more recent projects such as the University of Tennessee’s Natalie Haslam Music Center, Johnson & Galyon has a history of building long-term relationships with their clients through an exceptional building experience. Johnson & Galyon Construction would like to wish everyone a happy and safe 4th of July weekend!